Bottom Line: This playground won't win any awards, but it's a great spot bike riders. It also has decent morning shade. The lovely gardens, open space to run and the nearby creek to explore are nice pluses. 3/5 stars. Worth Noting: No swings*, no fences, creek nearby. Bathrooms are a short walk down a paved path. *Swings available on a second playground, ~100 yards down the path, at the Custis Trail junction. 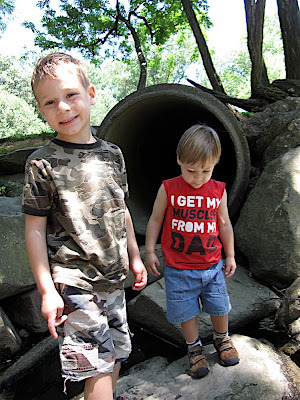 I took my boys to visit Bon Air Park last week on a nice not-too-hot kind of day. We had been here a long time ago (pre-Adam) and I remembered the play structure being cute and shady. 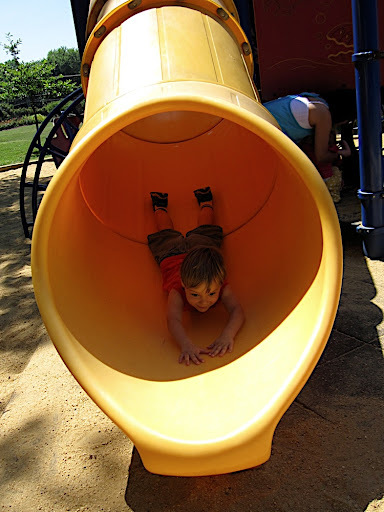 A nice shady paved trail runs alongside the playground, making it a good bike riding option for Sam. We were not disappointed. We decided to check out the bike path first. It runs from the parking lot down to the Custis Trail and is almost entirely shaded. My plan was to do a one mile loop with the boys – Adam on the glider and Sam on his bike. 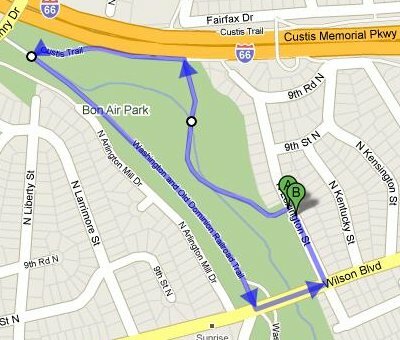 The loop would take us down to Custis Trail (which runs along I-66) and then, after a short distance, veer left onto the W&OD trail, which runs along the west side of Bon Air Park, on the other side of the creek. We closed the loop by coming up to Wilson Blvd and taking it back to the parking lot. It was the perfect biking loop — for Sam. Not so much for Adam. He would glide for a bit, but then want help, or decide he was done. This meant I had to scoop him up and throw him in my jog stroller, along with the glider. Then I would walk/jog to catch up to Sam, who was patiently waiting a little ways down the path. At the junction of the Bon Air Trail and the Custis Trail, there is another playground. It has a simple play structure and two swings, but is entirely in the sun. There’s nothing special about this playground, but we stopped and played for a few minutes before continuing on our ride. 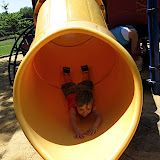 When we got back to the park, we checked out the main playground. The play structure is shaped like a boat and in the morning, is fairly shady. The surface is what I would term “dirty sand”. UPDATE: 10/1/11 — the play area has recently received a new installation of clean white sand. It looks much nicer. The boys enjoyed playing on and under the structure and Sam did some more riding. I’d let him bike down to the bathrooms and back – maybe 100 yards away but still in view. In addition to the play structure there is a nice grassy field to run around in. The creek also runs through the park, but it is far enough away from the playground that kids won’t notice it or be drawn to it unless you point it out. Bon Air also has beautiful gardens – a rose garden, a sun”garden, and a shade garden. The kids weren’t interested in any of that, so we didn’t check them out, aside from me snapping a few pics on our way out. After playing for a while, we were ready for lunch. We snagged one of the many picnic tables and had a nice lunch next to the creek. Afterwards, I let the boys explore it a little bit. Amazingly, no one got soaked! At the end of our stay, Adam was melting down and ready for a nap, so we got out of dodge as fast as a cranky toddler would allow. But the park was quite nice and I’m sure we will be back. I recommend it for toddlers and bike riders especially. "Bon Air Park (22205)", 5 out of 5 based on 1 ratings.